Clothes and accessories worn on a body have a wide range of sizes such as sizes for tops, bottoms, bras, footwears, dresses, bags and for other kind of accessories. 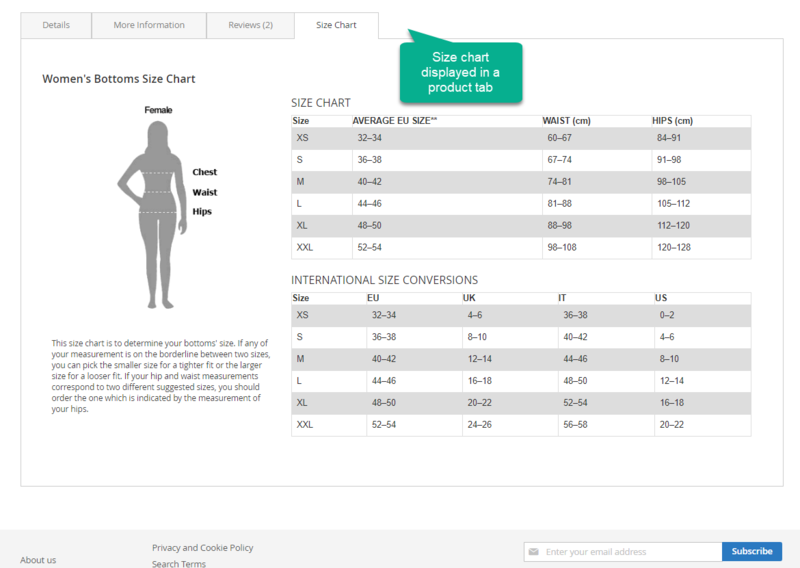 With each item, there are different female and male sizing systems all over the globe like US size, UK size, EU size and some famous brands even have their own sizing system. As the size is varied depending on individual product and sizing standard, customers are concerned of the accuracy in choosing sizes. Unlike shopping at a bricks-and-mortar, buyers cannot try things on and decide which size suits them. Hence, the lack of understanding of available sizes can cause mistakes in selecting appropriate items. Consequently, your products can end up being abandoned or returned. 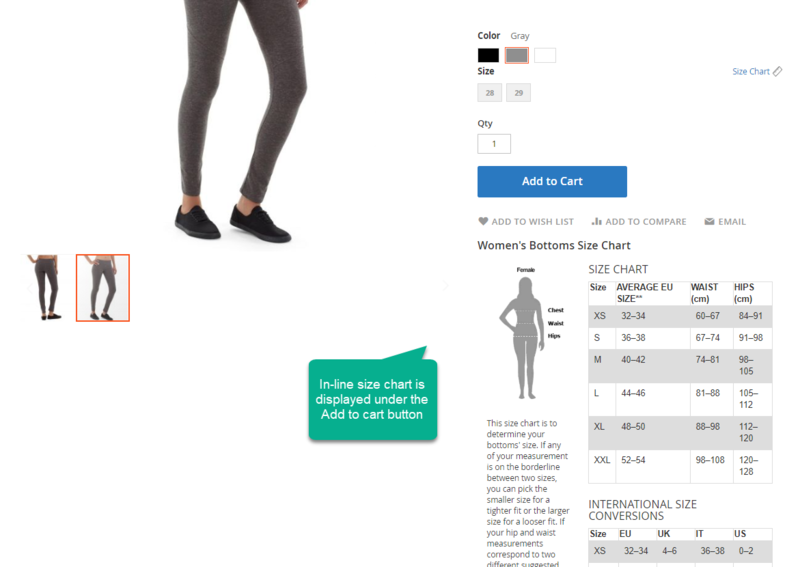 Having a clear notice of what sizing systems are available for every single item on your store is a must, especially when you run an international store when customers are familiar with their own sizing systems in their home country. 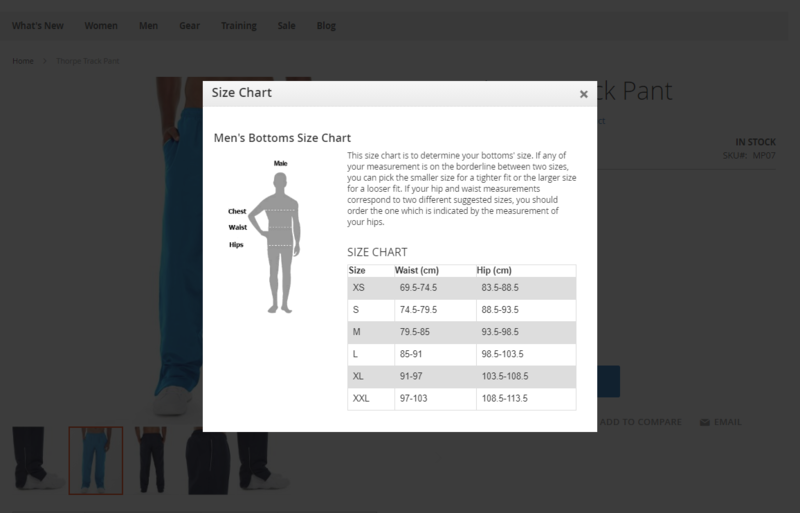 Size Chart Popup by Mageplaza allows featuring size tables on product pages with customizable content, which means you are enabled to add as many size charts as needed. Native Magento 2 does not support online stores in featuring size guides automatically for specific categories or products. E-stores with a large number of different product types have to deal with huge workload if they want to present size guides for each item/category manually. Plus, the position to display size tables on product page is often inconvenient for buyers who want to search for their sizes. 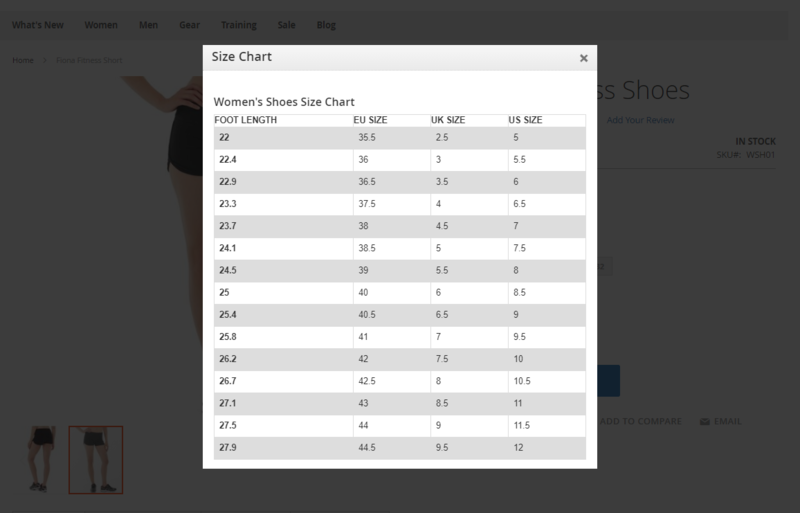 Mageplaza Size Chart extension for Magento 2 helps to put a Size Chart indicator right next to the Size attributes on Product page. This is an ideal easy-to-see place to catch buyers’ attention when they are about to search for sizes. 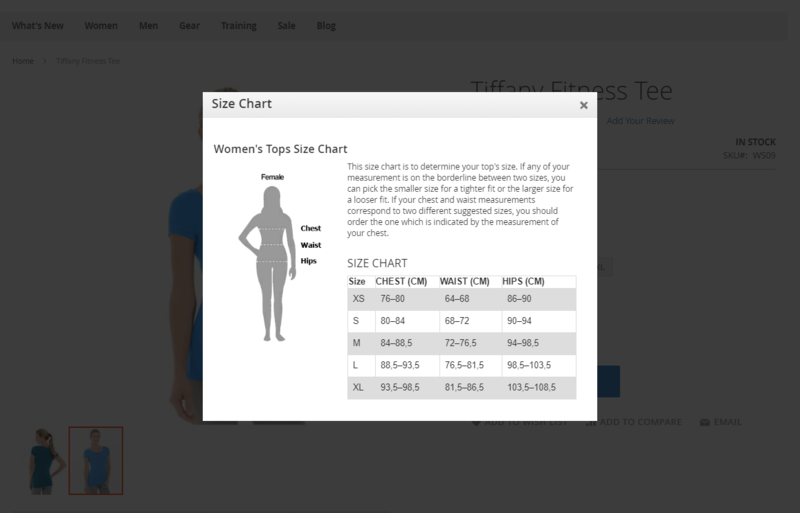 When clicking on the Size Chart label, an inline or popup guide shows up with detailed instruction on sizing and selecting appropriate sizes. 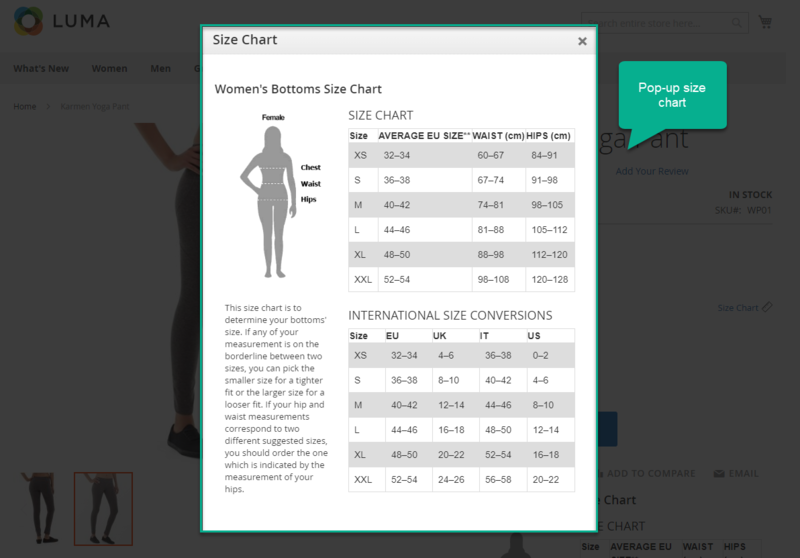 There are plenty of pre-made size chart which are handy for online stores. Moreover, Mageplaza Size Chart extension allows admins to apply custom CSS in editing existing size tables or creating new ones for their own stores. 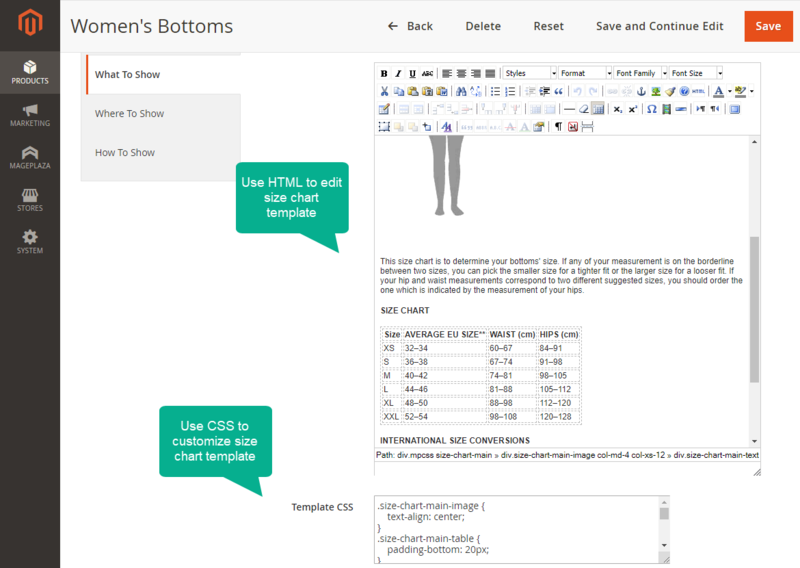 Visual images for instructions, links for help and size tables with infinite styles can be easily implemented. Mageplaza provides six standard size tables free of charge. 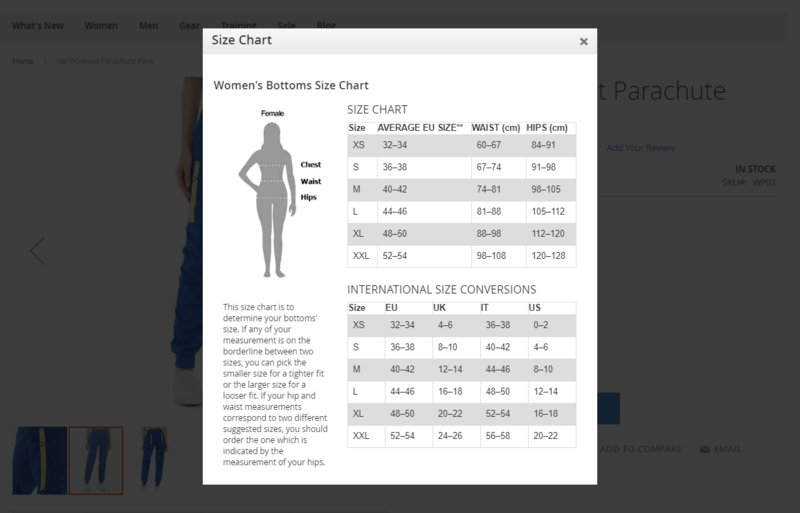 These size chart templates are designed to suit sizing system standards which are currently popular. 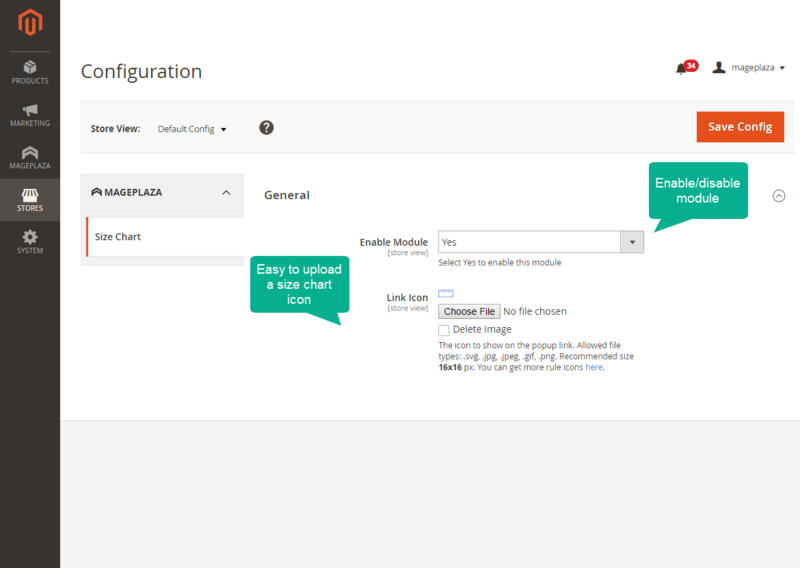 The ready-to-use size guides are always available to be used right after Mageplaza Size Chart extension is installed. Admins are free to use the premade templates to display size charts on product page appropriately. However, if you want to change the content, design, or any factors in the templates, admins can get all these things done by using HTML which is already integrated in Size Chart for Magento 2. The content of size guides can be changed or updated easily with the support of a user-friendly editor in the backend. 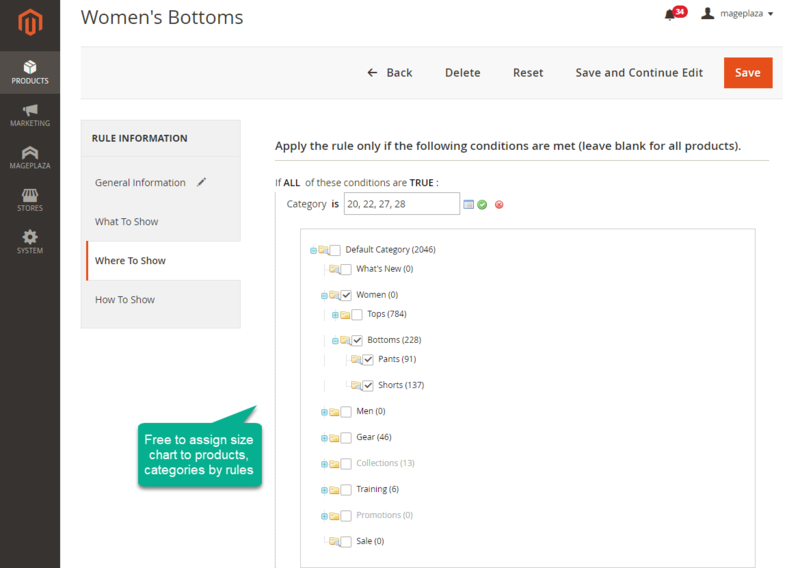 Basically, there is no sizing guide template or content which is limited on backend. Admins can insert photos, videos and buttons into the size table with ease. 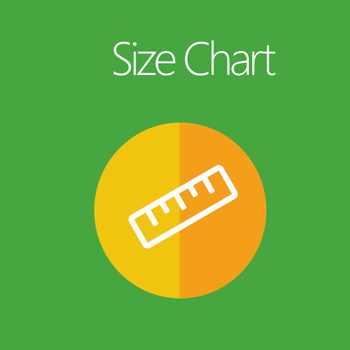 Size chart label, rule icon, colors of text, background and border are allowed to be selected by admins to create the best size guides for your online store. 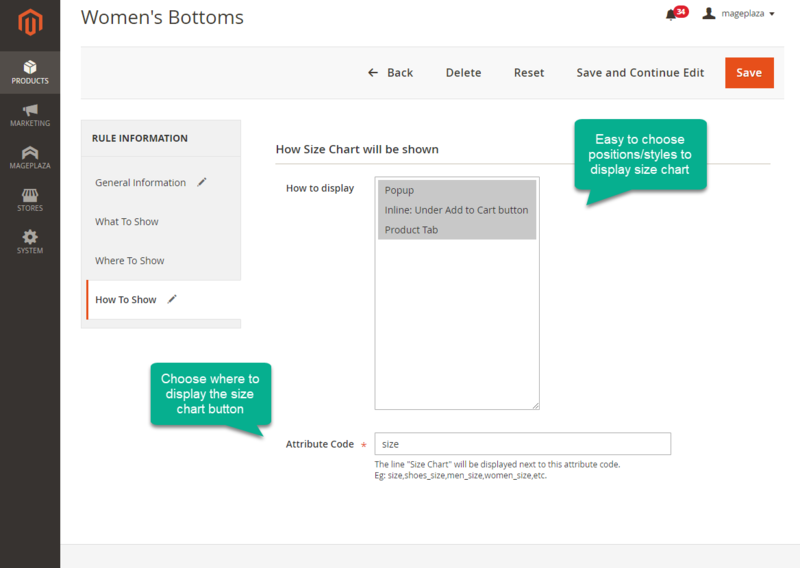 The icon of size chart can be placed at multiple positions on product page by configuration from the backend. 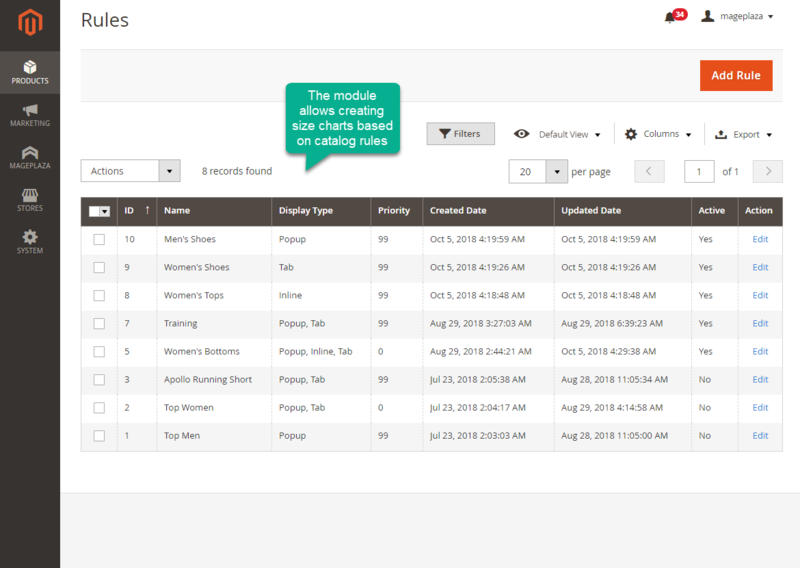 Besides, Mageplaza Size Chart allows displaying this size chart button manually by inserting snippet. With custom CSS, admins are free to customize size tables to suit online stores’ design style without coding. filter_drama Which rule will be applied on a product which belongs to more than 1 category? 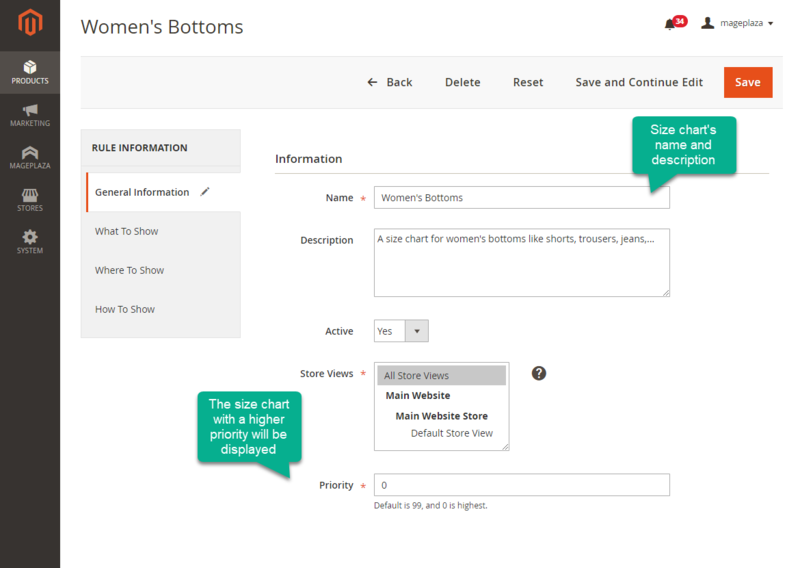 filter_drama If product A has breadcrum: Home > Women > Tops > Jackets > product A, Use the validate rule/parent category is set for product A and Jackets category, but rules for Tops category are disabled, Is Size Chart still displayed for product A? Yes! Size chart for product A exclusively depends on the category that it directly belongs to which is, in this case, Jackers category. To clarify, all the rules in Manage Rule will be filtered, and only the rule with conditions being met and the priority being highest will be applied. filter_drama Popup Size Chart is not displayed on the frontend. filter_drama What kind of content can I use for the size guide? The module is easy to use for beginners like me. I find the pre-made templates quite handy and customizable. Mageplaza Size Chart works well, I can see that fewer customers contact us for size guiding. We seem to have fewer troubles in product exchange and return for sizing problems. Great extension! Eric is excellent. He answered all my queries on Size Chart extension. It's so clear and easy to understand the pattern. Thank you so much! 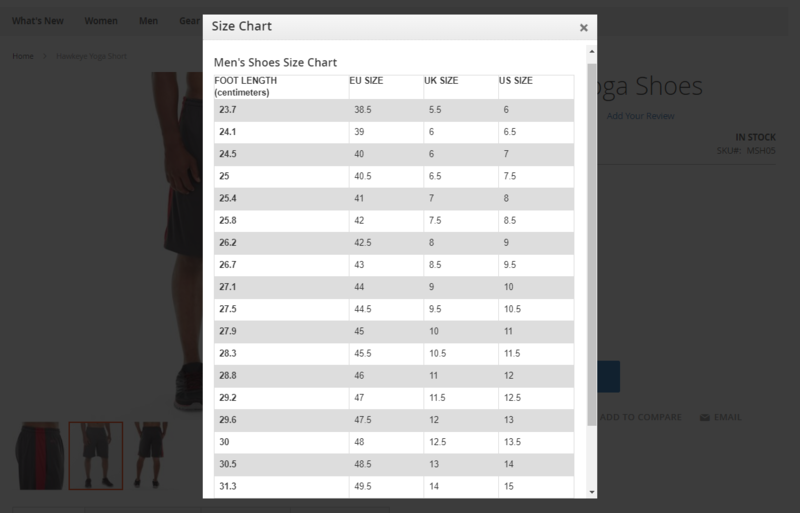 Size Chart extension is very useful for our online store. Our clothes are customized to make, we need to put Size Chart for each model (t-shirt, full sleeve shirt and women tops, and bottom). 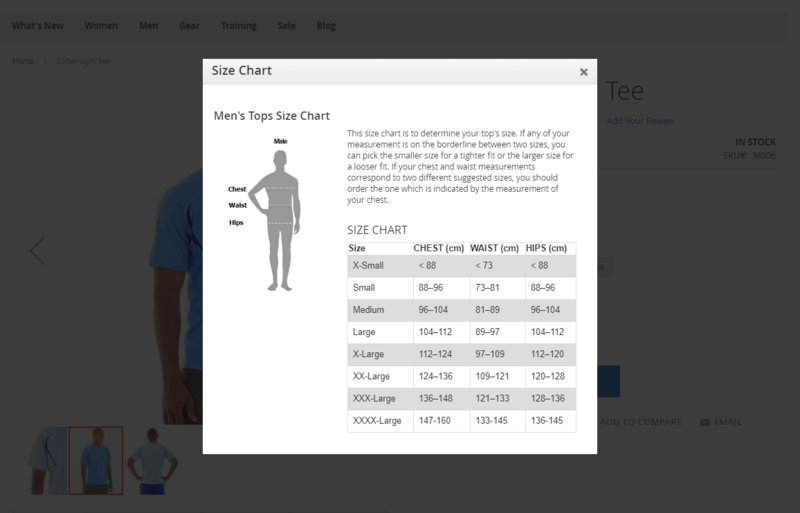 Size Chart also has 3 different places to display in product details page. They are popup, inline and tab in the products tab. It's so convenient.